The Australian Mark Frendo wins today’s time trial stage at Laura and is able to increase his general race lead by almost a minute. Race favourite Cory Wallace isn’t able to race away from his strongest rival this year, finishing in third behind Josef Benetseder from Austria. While Liesbeth Hessens again impresses the entire Crocodile Trophy rider field and crew by clocking in the 25th-fastest time, a race for places two and three is unfolding between Giordana Sordi and Maria Cristina Prati from Italy – not even eight minutes separate the two in the general womens classification ahead of tomorrow’s marathon stage into the Aboriginal coastal community of Hopevale. Under blue skies and in sweltering 40+ degree heat the Crocodile Trophy riders lined up for a 38-minute time-trial stage today at Laura. Starting in reverse order of the general classification with one-minute gaps the race track too them onto a corrugated main road out of Laura and then onto a smoother, yet partly sandy dirt track in the Lakefield National Park. “I’ll try to catch Jiri, but don’t really want to see Mark”, said Cory Wallace whose plan was not to be caught by race leader Mark Frendo who started one minute behind him and who was on the chase right away. “I came up to Cory at about the half-way point and stayed a few hundred metres back just to catch my breath and recover a bit”, admitted Mark Frendo, who then attacked with about 5km to go. But Wallace wasn’t going to give up easily, catching Frendo just before the finish line, however, still 57 seconds slower, due to the time trial starting grid. Benetseder squeezed in between the two with a 24 second gap. “I’m happy that today went so well, all I really wanted to do was contain any losses, because I knew that Cory would go hard”, concluded Frendo, admitting that he was slowly starting to dream of Cooktown and taking out the Crocodile Trophy victory for Australia for the first time since Adam Hansen’s win in 2005. For supporters it was a welcome change to stay another night at a stage destination. No tents were to be packed up, the catering crew didn’t have to dismantle their entire Outback kitchen set up. One of them, Maarten Neyens had been accompanying the event as a supporter for his Lotto Belisol racing team mate Sander Cordeel. However, since Sander’s crash and race pullout the two likable Belgians have been helping out in camp: Sander in the kitchen with one hand in a sling and Maarten building tents for the riders. Today Maarten couldn’t help but get a taste for Outback racing and was one of the starters at today’s time trial, which he completed in 1:18:05. “Next year we’ll come again and race the entire Crocodile Trophy – what an adventure”, beamed Neyens after his race today, who said that former Croc-winner Adam Hansen, who races for the same pro-cycling team in Europe, had told them so much about his home country and the Crocodile Trophy that Sander had decided to participate this year. 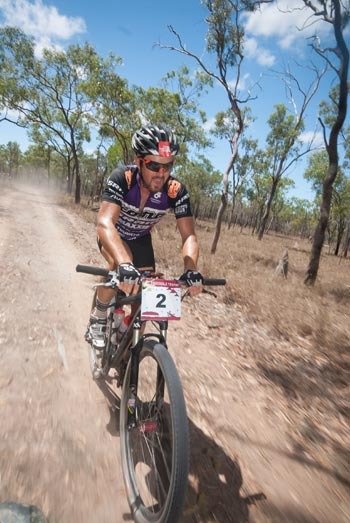 “Being part of this event, travelling through the Outback and seeing the wide variety of terrain and tracks that you get to race makes me want to come back as a rider”, Neyens promised. Tomorrow’s second-last stage will take the riders towards the coast again and camp will be set up in the Aboriginal community of Hopevale. Wide Outback highways and river crossings await the riders on the 113km and 1100m stage.